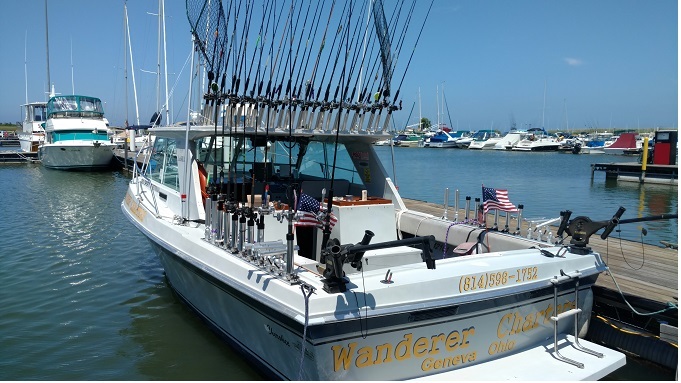 We will be departing from Geneva State Park Marina which is located approximately 50 miles east of Cleveland OH. About 6 miles north of I 90 on route 534. We will be trolling for walleye & also catching some Steelhead . We will be running planner boards, dipsey's, jet divers, down riggers & possibly steel line. We supply all the bait and tackle needed you do need a valid Ohio fishing license which is available at the marina or online. There is a single day license available. Items to bring include cooler to take home your catch, sunglasses, hat &camera. There are several motels within 12 miles of the boat and campgrounds in the area during the summer months I recommend having a reservation if you plan on staying overnight. The WALLEYE & steelhead trip is 8 hours dock to dock or limit of fish . In the event of a cancellation, there is a 4 week notice required for rescheduling trip. Cancellation by the captain due to weather or any other reason will result rescheduling of your trip. To view more pictures click here Walleye,Perch & Bass may take awhile to load.